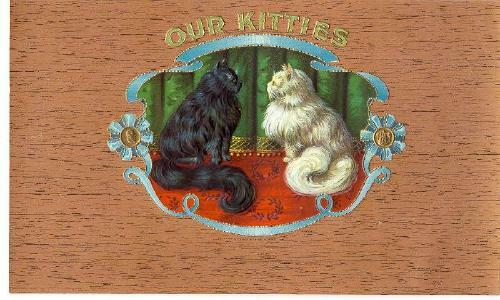 Embossed Our Kitties cigar inner lid label. Features beautiful black and white cats on a red and green background, encircled by light blue ribbon. The graphics are enhanced with gilt accent and shown on a wood grain background. The label measures approximately 10 x 6 inches. It is in Very Good to Excellent condition with barely noticeable corner tip wear. It has three tiny scratches (less than 1/4 inch) on the paper surface.